August 20th until September 9 2014, a festival held in Yogyakarta Special Region called Festival Kesenian Yogyakarta (Yogyakarta Art Festival, abbreviated as FKY) is held. This year commemorates the 26th year of FKY, with a main theme of ‘Do Dolan’ (two meanings in Javanese: Let’s Play or selling). The festival itself is mainly held in Ngasem Market Plaza and Tamansari Square of Tamansari Water Castle. This year’s festival is hauled as more special because it’s held in all 4 regencies and 1 municipality of Yogyakarta. Yogyakarta is a city famous of its traditional arts and crafts, in FKY you can enjoy many of them in one place and one event, from fine arts, performances, competitions, until products. The opening of the festival was held in the 20th, with 3 different events. Art carnival (kirab seni) was held with a route of Prau Street-Sudirman Street-Tugu Monument-Margo Utomo Street from 4:30 pm until 5:30 pm. The carnival wa s joined by 26 different contingents from different communities, organizations, institutes and art groups of Yogyakarta, ranged from 26 angkringan (Yogyakarta-styled street vendors), Gembiraloka Zoo, Jampi Gugat dancing community, untol Papermoon Puppet theatre. After the festival, at 7:40 pm the opening ceremony was held near the Tugu Monument with many art performances: gamelan (Indonesian-styled musical orchestra), percussion, dances, and also including performances from Jogja Video Mapping Project (JVMP), turning the white icon of Yogyakarta into rainbows. The opening ceremony was closed with fireworks show. In the same time with the opening ceremony, the opening of the Art Market in Ngasem Market Plaza was also held. If you are visiting Yogyakarta in these time period, it will be nice to come. Other than seeing live music, dances, and theatre performances, you can also buy traditional food and snacks and art and craft. You can also join art-related competitions and try how to make the craft. The catwalk was done on the street, from Central Park until Sport-Hall Jember, for a total of 3.6 kilometres. The five-day carnival started by marching band and defile, held different theme for each day: Kids Carnival in 21, Artwear Carnival in 22, Wonderful Archipelago in 23, and Grand Carnival in 24. International Exhibition was held from 20-24. This year, more than 850 people joined the parade, attracting thousands of visitors.From August 20th until 24th, Jember Fashion Carnival was held in the Jember Regency, East Java . 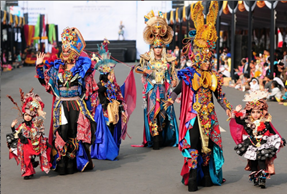 Jember Fashion Carnival is a fashion carnival held with different theme each year, either following fashion trend for the respective year, Indonesian traditional costume, or pop culture. Different from other fashion carnival, costumes donned in JDC is designed, made, and showcased by the participants, including the makeup. The participants each year range from different age and educational background and social status, mostly amateur. There will be a team of design consultantz ready to help the participant in realizing their dream design, including the way of designing, presenting, runway-walking, dancing and others. You can also be a voluntary participant by registering in the website. For the best costumes in each category, there will be prize waiting for the winning participants. JFC is not only about fashion, culinary, photo, and painting exhibition also enliven the carnival. This year marks the 13th Carnival held for introducing the City of Jember as a fashion city and educating and entertaining the citizens of the city, with a tagline of Triangle. Starting simple in the first year of the carnival by the idea of the designer Dynand Fariz, JFC is now being tutted as a large scale festival and already showcased in Shanghai, London, and India and included as one of the world most unique carnivals. Similar to Jember Fashion Carnival, other local carnival of Indonesia, such as Solo Batik Carnival in Surakarta, Central Java, Tenggarong Kutai Carnival in East Kalimantan, Bangka Belitung Carnival in Bangka Belitung Province, Kuta Carnival in Kuta, Bali, Jakarnval in Jakarta, Batam Kepri Carnival in Batam and Riau Islands, all under the Wonderful Archipelago Carnival Indonesia (WACI). Other than the festival mentioned above, there are also festivals held in these month, such as Tomohon International Flower Festival in Tomohon, North Sulawesi, Sail Raja Ampat in Raja Ampat, Papua, Ubud Village Jazz Festival in Ubud, Bali, Kelimutu Lake Festival in East Nusa Tenggara, Pasar Kangen Jogja in Yogyakarta, Jakarta Malay Festival, and others. Posted on September 22, 2014, in Culturing and tagged aseankorea, august, events, Festival Kesenian Yogyakarta, fky, indonesia, Jember Fashion Carnival, jfc, Yogyakarta Art Festival. Bookmark the permalink. Leave a comment.